Lots of people have been asking me about the striking cover of Mr Barry’s War (out in paperback next week) so here’s a little more about it. The painting belongs to the Government Art Collection (ref GAC 12453). I’d no idea where it hung when I suggested it as an image for the dust jacket but romantically liked to think it was in a third consul’s office in Istanbul or similar: a reminder of cold foggy London in a hot humid climate. As it turns out, it’s in Downing Street (illusions shattered). It’s called Houses of Parliament from the Thames by Moonlight so it does what it says on the tin. And it’s by an artist called Henry Pether (1800-1865), a member of a painterly clan called ‘the Moonlight Pethers‘ who made a speciality of – yes – painting moonlit scenes. Their styles were so similar it is sometimes difficult to determine attributions between uncle, father and sons, but this one is definitely by Henry. 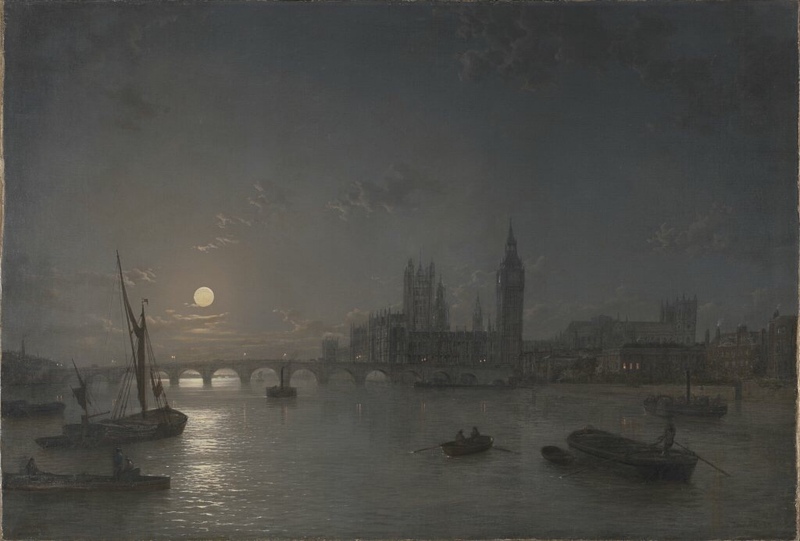 This view must have been painted sometime between 1862 (the date of the completion of the new Westminster Bridge to a design of Charles Barry) and 1865 (Pether’s death). I particularly like the wherries on the river, and the gaslights on the bridge parapet. Its smoky mysterious appearance reflects the Gothic nature of the storylines in Mr Barry’s War and the huge part which the Thames itself played in the construction of the new Houses of Parliament. During the book, the river moves from being a clear, fresh, watercourse (full of dace, perch, salmon and other happy fish) whose churned-up mud spits out ancient archaeological treasures as the foundations are built, to being a source of terrible pollution and stench by the end of the rebuilding. Could that possibly be a metaphor of some kind relating to the whole project? 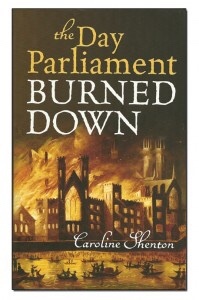 The jacket designer at OUP then very cleverly took the painting and managed to create a cover which, when set alongside The Day Parliament Burned Down, makes them look like day and night, light and dark, prequel and sequel…which they are. I really love them side by side. See what you think. Dr Caroline Shenton is an archivist and historian. She was formerly Director of the Parliamentary Archives in London, and before that was a senior archivist at the National Archives. Her book The Day Parliament Burned Down won the Political Book of the Year Award in 2013 and Mary Beard called it 'microhistory at its absolute best' while Dan Jones considered it 'glorious'. 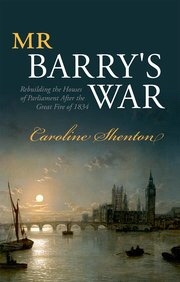 Its acclaimed sequel, Mr Barryís War, about the rebuilding of the Palace of Westminster, was a Book of the Year in 2016 for The Daily Telegraph and BBC History Magazine and was described by Lucy Worsley as 'a real jewel, finely wrought and beautiful'. During 2017 Caroline was Political Writer in Residence at Gladstone's Library.